Lists are powerful tools to group similar elements, and lists give visitors to your site an easy way to zoom in on groups of information. Just about anything fits in a list, from sets of instructions to collections of links. A numbered list consists of at least two items, each prefaced by a number. Use a numbered list when the order or priority of items is important. 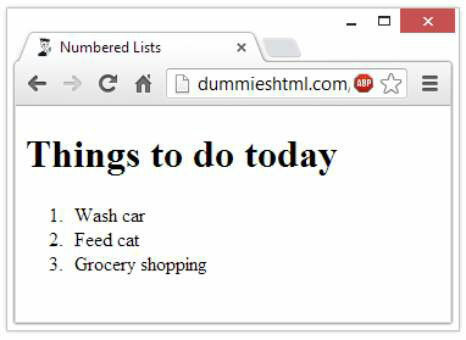 The ordered list element (<ol>) specifies a numbered list. List item elements (<li>) mark each item in the list. This figure shows how a browser renders this markup. 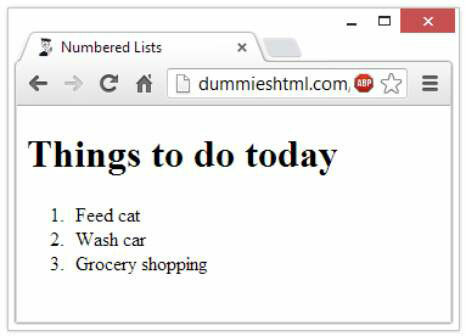 You don’t have to specify a number for each item in a list; the browser identifies list items from the markup and adds numbers, including a period after each one by default. If you swap the first two items in the list, they’re still numbered in order when the page appears, as shown in this figure.